Now John Mellencamp understood and for those those accustomed to regular exercise, Delayed Onset Muscle Soreness, DOMS is a normal part of training and competition and often a welcome sensation for some. For those still googling John Mellencamp, DOMS can be a nasty surprise upon waking the day after exercise, and the day after that, and the day after that…..
DOMS, or delayed onset muscle soreness, is exercise related muscle pain that occurs after heavy or unfamiliar exercise, and most commonly occurs after eccentric exercise which is where a muscle lengthens under load such as the down phase of a bench press or squat. This could happen after playing two games of rugby on a weekend when you’re used to only playing one, completing an extra training session for the week, increasing your weights at the gym, or going for a 20km run when your used to running 10km. 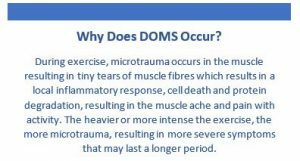 DOMS typically develop within 24 hours of unfamiliar exercise and peaks 48-72 hours post exercise1, in some cases lasting up to 5 days. DOMS is like the common cold of the sports and exercise world – there is no cure! Although DOMS can be quite painful and uncomfortable at times, there are no long-term harmful effects. However, each time you overload your body, whether it be by increasing resistance, intensity, duration or type of exercise, you run the risk of experiencing DOMS again. Luckily, DOMS is a part of our body’s process of adaptation, and once you’ve had DOMS after a certain activity you are unlikely to suffer DOMS again (or at least to the same extent) for the exact same activity. So the next time you feel that “good hurt” in the days following a workout, be prepared to wait it out knowing that you’ll come back better and stronger! 1Hotfiel T, Freiwald J, Hoppe MW, Lutter C, Forst R, Grim C, Bloch W, Hüttel M, Heiss R. (2018) Advances in Delayed-Onset Muscle Soreness (DOMS): Part I: Pathogenesis and Diagnostics. Sportverletz Sportschaden. 2018 Dec;32(4):243-250. 2Henschke, N., & Lin, C. (2011). Stretching before or after exercise does not reduce delayed-onset muscle soreness. British Journal of Sports Medicine, 45(15), 1249-1250. 3Xie, Y. L., Feng, B., Chen, K., Andersen, L., Page, P., & Wang, Y. (2018). The Efficacy of Dynamic Contract-Relax Stretching on Delayed-Onset Muscle Soreness Among Healthy Individuals: A Randomized Clinical Trial. Clinical Journal of Sport Medicine, 28(1), 28-36. 4McGRATH, R., Whitehead, J., & Caine, D. (2014). The Effects of Proprioceptive Neuromuscular Facilitation Stretching on Post-Exercise Delayed Onset Muscle Soreness in Young Adults. International Journal of Exercise Science, 7(1), 14-21.